Grace Han Wolf is the first Korean American woman elected to office in the Commonwealth of Virginia. 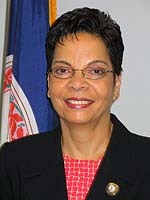 Serving her third term on the Herndon Town Council, Wolf represents the town as advisory director on the Committee for Dulles Board of Directors and as a member of the Fairfax County Economic Advisory Commission. In 2014, Wolf was appointed by Governor Terry McAuliffe to the Virginia Commission for the Arts as Commissioner and was appointed to the Board of Directors for the Arts Council of Fairfax, as well as the Fairfax County Park Authority. Wolf is an active member of the regional AAPI community and one of the founding members of the Jade Philanthropy Society, which aims to encourage and facilitate local philanthropy by Asian Americans in the Washington, DC metropolitan area. DAAV recently caught up with Wolf to learn more about her role as the Herndon Town Councilmember.